Labour is pledging to provide 8,000 homes "immediately" to house people with a history of rough sleeping, should it win power. Party leader Jeremy Corbyn said they would also help councils "take over" properties kept empty deliberately. He said the scale of homelessness was "disgusting" and "wholly unnecessary". Conservative David Lidington said the reasons for rough sleeping were complex and the government had set ambitious targets to reduce it. Outlining Labour's plans, Mr Corbyn pledged more council properties with lifetime tenancies at secure rent, and more intervention into the private rented sector. 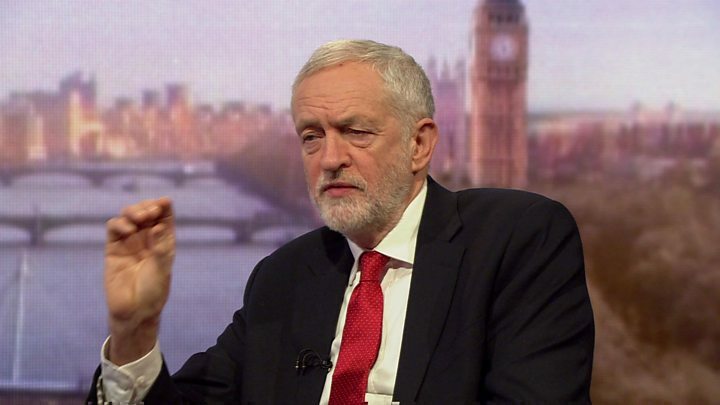 Asked what a Labour government could do for people who were already homeless, Mr Corbyn told BBC One's Andrew Marr Show: "Immediately purchase 8,000 properties across the country to give emergency housing to those people who are currently homeless and at the same time require local authorities to build far more." A party spokesman later clarified that the 8,000 properties would not be bought using compulsory purchase powers but would be acquired by "immediately striking a deal" with housing associations to free them up as they fell vacant. They would then be replaced by new properties to be built under Labour's pledged house building programme. Mr Corbyn went on: "We would give local authorities the power to take over deliberately kept empty properties, because there is something grossly insulting about the idea you would build some luxury block and deliberately keep it empty. "Surely we have to have a social objective and a social priority in our society? ", he said. Labour says they would work with charities and outreach workers to identify rough sleepers and offer them accommodation "as quickly as possible" and tenancies could be modelled on schemes already in place - such as the "clearing house" scheme operated by the St Mungo's charity in London. The party says it would make better use of existing "empty dwelling management orders" - which give councils powers to let out properties which have been vacant for at least two years, with some exemptions including for second homes, people taken into care and armed services personnel on active service. New figures out last week showed rough sleeping in England had increased for the seventh year in a row. Conservative Cabinet Office Minister David Lidington said there were "a number of different reasons" rough sleeping had gone up - including mental health issues and drug and alcohol problems. "We have pledged to halve rough sleeping by 2022 and eliminate it by 2027," he said. "We have backed new legislation which is enabling us, with local authorities, to address the reasons why people become homeless and sleep rough, so that we prevent it, rather than try to deal with the problem when it occurs."